If you were ever a teenager (and I presume you must have been! ), you’ve probably been through this. For you, maybe it was Kim Wilde or Kylie or Boy George or Freddie Mercury. If you still are a teenager, maybe it’s Lady Gaga or Justin Bieber. But for Chris Limb, it was Toyah. It was 1980, Chris was fifteen, his friends were fans of Debbie Harry and Kate Bush but somehow Debbie and Kate just didn’t do it for him – “Not odd looking enough,” he says, “Not punky enough.” And then he discovered a girl called Toyah. At the time, she was not a huge star. Chris first noticed her in an episode of the TV detective drama, Shoestring. And it was infatuation at first sight. I Was A Teenage Toyah Fan is a very unusual musical memoire. 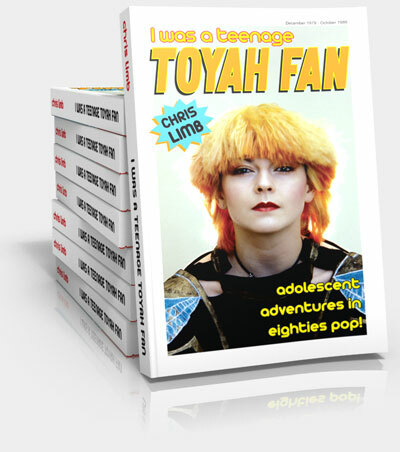 Even though it has a lot to say about Toyah herself, mainly in the early 80s, it is not a rock star ‘biography’. It is, in fact, a reconstruction of a fleeting but crucial period in the author’s life. It is about a teenager growing up in the 80s. Many teenagers both then and now, have a tendency to feel dissatisfied with the day-to-day dullness of their lives. For some of us, a glimpse of the possibilities of a ‘world beyond’ become focussed through a specific person. In the 70s, Bowie and Bolan with their androgynous ‘glam’ certainly gave me a view of a life that I had yet to experience. For Chris, in the 80s, Toyah had a similar effect. If you are, of were, a Toyah fan, this book will obviously have a special appeal for you. But you don’t have to be fixated on Toyah to enjoy it. In many respects, Chris Limb’s book is a description of a common experience: the vague yearning dissatisfaction of a teenager looking for something, just something to take him (or her) beyond the mundane – and finding that 'something' crystalized in a rock star. For 80s enthusiasts, the book has the added appeal of recalling so many of the defining elements of that decade in the UK. There are recollections of the magazines (Number One, Flexipop, Zig Zag), the TV shows (The Tube, The Russell Harty Show, not forgetting Top Of The Pops) and all kinds of other evocative details. Chris Limb’s obsession with Toyah was not just a passing phase, however. First he wrote to his idol, then he met his idol; in fact he got to know Toyah very well and eventually ran her official fan club, Tellurian. If you want to know how Chris made the transition from fan to friend, read the book!